Paris is a delightful city both in the summer and winter months and has a wealth of discoveries waiting for you. Marvel at the stunning structures such as the Eiffel Tower, the Louvre, Nortre Dame and Sacre Coeur to name but a few. 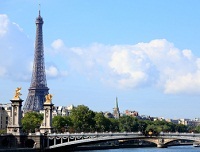 Paris conjures up the notion of romance, fashion and art as well as fine dining and culture. A popular city break and destination for those wanting a romantic weekend away, it is just a short hop from the UK. There are plenty of flights and airlines flying between the UK and Paris, most of the UK airports including the smaller regional airports will have at least a few flights to Paris, France every week with a huge choice of departure times every day from the larger airports. Because of the short distance involved, direct flights to Paris are very popular and are operated by airlines such as Air France and British Airways as well as low cost flights, France on airlines including easyJet and Jet2. Stroll around France’s beautiful capital that appeals to just about everyone, whether you are looking to do it on a budget or go all out or something in-between. You can reach Paris in just under an hour, so it’s never long until you are walking the boulevards, streets and alleyways lined with stunning authentic architecture and little road-side cafés filled to the brim with locals passing time over a cafe au lait. Paris is very easy to get around, especially by Metro where you can buy 10 tickets for just a couple of Euros, explore this fascinating city and immerse yourself in the French culture. Most of the main attractions are within walking distance of the centre. A fantastic walk through the city starts from The Eiffel Tower before heading to the L’Arc de Triomphe down Avenue Champs-Élysées, through Jardin des Tuileries towards The Louvre. Have a wander around to see The Mona Lisa and other magnificent works of art from throughout the centuries and incredible ancient collections from around the world. From The Louvre you can walk a little further next to the River Seine to cross one of the few bridges to the little island, Île de la Cité, where you’ll find the majestic Notre-Dame de Paris. From there if you cross over the bridge on the other side back on to the mainland you’ll walk into the historic Quartier Latin and Saint Germain which is the hip and trendy area full of great restaurants, bars and the heart of the vibrant Parisian nightlife. With so much choice of good food, they are all worth a try – but if you want some delicious French cuisine, L’Atlas does the finest French Onion soup, steak and crème brûlée as a 3 course meal. This quintessential Parisian street is also the home of Café de Paris, if fact it's just opposite L’Atlas, as well as many other establishments in which you are bound to find you ideal bar or lively pub for some after dinner drinks and a spot of nightlife. Finding a hotel is never difficult in Paris and there are so many fantastic places to stay, it all depends on whether you want to be in the thick of the action of Saint Germain or in the quieter areas such as the quaint area of Montmartre – home to the Basilica of Sacré Coeur, a beautiful masterpiece set upon the mount above the Montmartre. If you're feeling energetic then climb the stairs of Rue Foyatier from the bottom of the mount, tiring but so worth the view you’ll see from the top, alternatively you can take the little bus that winds through the cute streets or the funicular. After seeing the impressive Sacré Coeur, walk through the streets that inspired the great artists such as Vincent van Gogh and pause for a drink in one of the many bars that continually play tribute to the legendary Edith Piaf. Despite the great choice and number of daily flights to Paris, France, at certain times of the year flights do get busy. As with most airlines, air fares will rise the closer you get to departure so book early to get the cheapest flights and try to avoid travelling at particularly busy times of the year such as during the school holidays and at Christmas. Try our flight search box for the latest offers on cheap flights to Paris, France, we can also assist you with great value lastminute flights if you need to travel ar short notice. 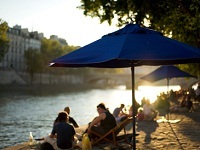 Paris starts to warm up during the spring months, although with a chance of rainfall, and is usually leading into summer temperatures by mid to late April. In the winter months it can be very cold and Paris can be subjected to snowfall during the coldest months of January and February so warm clothing is definitely an essential. Paris is known as an international hub for art and culture, with some of the world's most famous museums and galleries lining its streets. ..
As well as visiting landmarks like the Eiffel Tower, Notre Dame cathedral and the Arc de Triomphe, travellers looking for a memorable experience in Paris should take the opportunity to explore the city's colourful nightlife scene. ..
Paris is famous as a global centre of art and culture, with celebrated museums such as the Louvre housing works by some of the greatest painters and sculptors in history. .. There are plenty of locations to pick up affordable clothes and accessories in Paris, from large department stores to quaint shopping quarters offering endless experiences for bargain hunters. .. Visitors can embark on a tour of Paris to see some of its impressive modern structures and learn more about the city's artistic and cultural heritage along the way. ..